Oscar-Nominated for Best Foreign Language Film. "The Square deserves to do the rounds. This Cannes 2017 Palme d’Or winner takes aim at the pomposity and hypocrisy of artists — and indeed all people — who provoke reactions without thinking about the consequences of their acts. 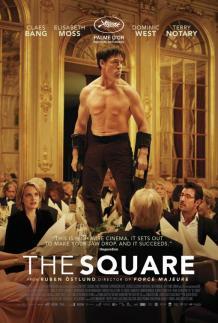 "The Square is the latest social inquisition from Sweden’s Ruben Ostlund, the eagle-eyed filmmaker whose previous work Force Majeure zeroed in on the ramifications of a man’s cowardice in a moment of crisis. "The new film, which co-stars Elisabeth Moss (TV’s The Handmaid’s Tale and Mad Men) and Dominic West (TV’s The Affair and The Wire), similarly focuses on the flaws of a male who considers himself above the moral and intellectual failings of lesser men. "His name is Christian, played by Danish actor Claes Bang, who looks a bit like Pierce Brosnan, a former James Bond — and Christian evidently considers himself every bit as suave and cool as 007. "He’s the head curator of Stockholm’s X-Royal Museum, a contemporary art institution that seeks to stir and shake people with its high-minded installations. A divorced dad of two preteen girls, he drives an electric car, says all the right things about good causes and congratulates himself for being both a thinker and a man of action.